Good morning readers, and this week we skid over into EC1, where the former working class area famous for its clock and watchmakers, Clerkenwell, is now so wealthy and chic that a corner of Exmouth Market will cost you a trust fund or seven. Clerkenwell was always ripe for the picking when it came to gentrification because it exposes one of London’s home truths : People don’t want Victorian. They want Georgian. They want flesh spilling out a bit, a hint of classic, a hint of decadence, a bit of filth. They want England before those killjoy Puritans got hold of it and blasted England with middle class Puritan morality. They want high ceilings and a sense of space. These please the modern eye ; show me a former Georgian London suburb and I’ll bet you your polenta that the area is now cluttered with public school types eating swordfish at £28 a plate. The English are not natural Victorians; but are Georgians. Highgate, Hampstead, Clerkenwell, Shoreditch, Old Street (the bits that the Germans didn’t bomb, nor post-war commercialism demolish), not to mention the parking headache known as Richmond upon Thames. There are few English sights more elegant than a Georgian sash window. And Clerkenwell is stuffed with some of the fruitiest Regency glass designs probably erected not long after Wellington won at Waterloo. And I do think it ironic that the important Battle of Waterloo, which was won on the fields outside Brussels, has a great enormous station named in its honour. Waterloo Station was an honourable representation of the success of the British in a battle which basically kick-started the nineteenth century of British imperial power. How ironic then, that 180 years later, Waterloo Station was the place where British politicians had to go to get on a train and go back to the site of the original battle, Brussels, to bow to new European rules and international legislatives. Not that the Regency knew this would happen, of course. They were too busy arranging cavalries and galloping randomly with Prussians. Moro is not new, of course, nor does it date back to the Regency, although the building it was in in Exmouth Market must do. I dined there on Tuesday with someone who swears he went to Moro in 1989. But in 1989 then, when we were beginning to spell “Sun-dried tomato” and thought Habitat was cutting edge, this place must have blown people’s minds. It’s always rammed, extremely jolly, warm and very very loud inside Moro. The menu is a respectful combination of Spanish and Moroccan. I say respectful, as the menu blends sensitively, and seems to respect the national characteristics of both. I started with a broad bean and rocket salad with something interesting on top that was goat’s cheese related, whilst Mr Bluebird had a wonderful braised pea concoction, with tiny girolle mushrooms, and so-tiny-they-were-nearly-invisible slices of cured ham. This was all on top of what we first thought was a large mushroom, but turned out to be a cheery piece of fresh toast. If you need dough to establish yourself in Clerkenwell, you certainly don’t need to bring your own dough to Moro. The breads are wonderful, sour dough in the main, a very generous variety included in the cover charge, and some with surprises – shards of fennel that are buried in the base, chinks of sea salt hovering in the middle. The only thing that wasn’t noble or fortifying was the prostitutes. Well, I think they were prostitutes, but obviously I didn’t ask them. Might have thought I was trying to book them for a job or something. I think the table behind us was partly composed of prostitutes, and of the extremely high-end, very tall and glamourous South East Asian variety. So much public peacock-like hair flicking and pseudo lesbian performance was going on during the starter on our neighbouring table, that I thought they were some kind of art installation. The two girls (one of whom actually looked a bit like a chap) were with the two of the most mild-mannered, dismal and characterless looking men I’ve ever seen. Much of our evening was spent ruminating on the nature of their relationship, although it was entirely obvious. The basis of their evening at Moro was economic, rather than gastronomic. I’ve always been a sort of supporter of prostitution – not actually, darlings, I mean, I have never been so desperate as to actually pay for it, you know – but at least you buy and then you get. You can’t say the same about an estate agent or a life coach. I find straightforward economic exchanges refreshing. And frankly, if I was a middle-aged man with a paunch and a bald patch, I suppose nothing could be more refreshing than having a charming supper at Moro and then paying someone £500 to bend over and let you do extraordinary things to them in a five star hotel of your choice. The two ladies (one of them possibly a chap – see above) spent quite some time talking loudly together whilst locked into a female toilet cubicle. This wouldn’t have been a problem, only Moro has just the two loos, and the fact that one of them was being monopolised by two hookers in drag was a little distressing for the queue of us outside. Eventually they vacated the cubicle and tottered out. I was the first in after them. There were strands of tenacious, very long hairs on the floor and one calmly draped over the toilet paper. They even carried on flicking their hair where no one could see, clearly. Back to the food, my main meal was so delicious that I can barely express it – pink, delicately cooked slices of lamb with coriander butter, with fat chickpeas sitting in a peculiar dahl and a perky Greek style salad. Two of our fellow diners went for the chicken, and Mr Bluebird opted for a seafood fish tagine which was apparently scrumptious. Moro is a great place for sherry fans – two pages of various sherries fill the first section of the wine list – but as we are not sherry fans we reverted to the massive section of Spanish wines available, which Moro sources from small producers on the Western coast of Spain (no Riojas here). We went for something which was third down on the list, extremely reasonably priced and was was on the loveliest wines I have ever tasted. The acoustics in Moro, however, are unforgiving. You have to scream at the person sitting next to you to be heard. This is not helpful when it comes to supper party parlance. I spent ten minutes listening to my husband tell a story about Luis Bunuel being taken to his first whorehouse when he was 13 by his father, and was under the impression he was talking about Oscar Wilde. I kept trying to picture Oscar Wilde slipping over the threshold of a house of ill-repute but the image wouldn’t stick. I found it very confusing. Obviously, what was going on on the table next to us was shaping our conversation topics as well. Dessert was lovely – and I had plotted it that morning in the office at 10am while salivating over the Moro menu online. I had Malaga ice cream with fat sultanas which had been soaked in sherry. It was a party on a plate. I wanted a party to go with the party on my plate so asked the waitress which dessert wine I should have to go with it, and she suggested “Pedro Ximenez Sanlucar de Barremeda”, which I am writing down for you, because if you drink one thing before you die, make sure it is this. It was a kind of not-overly-sweet red sherry. None of us are sherry drinkers, but all of us tried it and loved it. Mr Bluebird said it was even better than the Spanish stout he had ordered the last time we were there. A couple of double espressos saw us home, via the meandering Farringdon Road, still smacking of it’s peculiar Dickensian-chop-house aura. Old pubs have closed down. Travel bookshops with woodwork painted in duck egg blue or eau de Nil clutter about replacing newsagents and DIY supply shops. I thought I saw the Duke of Wellington vanish down a side street in search of whore, but clearly was mistaken. The last echoes of the mid 19th century in Farringdon are being batted out, and a strangely pretty early 19th century Georgian village has been re-emerging and reasserting itself in Clerkenwell in the last decade. It isn’t being tempered by the current economic climate, it is thriving. Moro provides excellent repast, tasty and original, and offers dishes that let the ingredients speak for themselves. 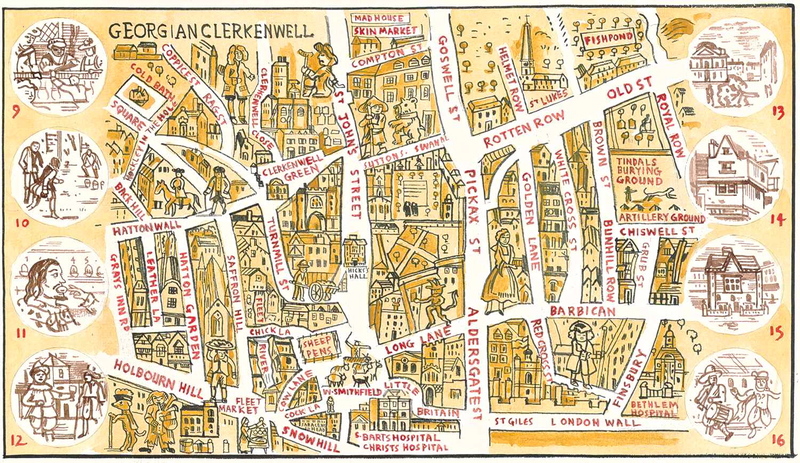 However, no matter how new, antiseptic and thoroughly middle-class Clerkenwell has become, you only have to turn your eyeline slightly to one side to see the prostitutes. You can take England out of the Georgian era, but, it seems, you can’t take Georgian decadence out of the English.